Link building is the process of getting other sites to link to back to yours. It’s arguably the most important tactic for improving your SEO. If SEO matters, then that means link building matters. For the person who manages a website, making a link is a simple task, similar to adding a hyperlink to an email. The challenge is that you can’t force someone to link to you, just like you can’t force someone to order machined parts from you. Your customers send you work, because they trust you. The more work your customers give you, the faster you can expect your business to grow. Links work the same way. The more links (trust) you get to your site, the faster you can expect the site to grow. You can pay for links, but that’s almost always a bad idea. Buying links is gaming the system, and can get you into trouble with the search engine police really quick. The point is you have to earn your links — and it’s easier than it sounds. If you think of links like endorsements, references, or votes that boost the credibility of your company, you can easily understand how, the more references you get to your company, the more credibility you can expect. However, like references, not all links are created equal. Links from government institution websites (.gov links) are high value for your business just like a public endorsement from a mayor, senator, or governor. These would make a bigger impact than an endorsement from your Aunt Martha. Nothing against your Aunt Martha, I’m sure her cooking beats the Mayor’s, but this is about links, not apple pie. The same goes for links from educational institutions (.edu links). Imagine if a university professor with a Mechanical Engineering PhD wrote about how your company was an expert at optimizing your speeds and feeds and getting amazing tool life in your machining operation. The endorsement from Dr. Tony Schmitz at UNC Charlotte is simply more valuable than the endorsement from your good ol’ uncle Tony who taught you how to run the old Bridgeport. Both Tony’s may be able to hear chatter from a mile away, but one of them has a PhD. and in the world of link building, that matters a lot. How valuable is it to your business if you’re listed as a top supplier to a big aerospace company like Boeing or an automotive giant like Chrysler? A link from a high traffic, high authority site from your industry can make a very big impact for your manufacturing site. Industry-specific media sites and blogs with a high amount of pages and traffic usually have a high amount of digital credibility as well. Keep in mind that high authority links can come from outside your industry too. If you got mentioned in a major business magazine, such as Forbes or Inc., those links garner tremendous value as well. Do links from smaller or lower authority sites matter? Absolutely. It’s actually important to have a healthy variety of links pointing to your site. If your link profile doesn’t look natural, it raises red flags to Google. Consider this -- great basketball teams excel at shooting three pointers, but they also make a lot of layups and free throws, with no single player scoring all the points. 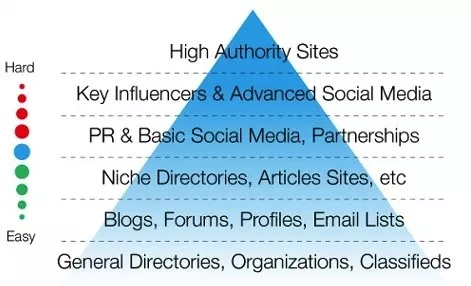 Similarly, you want high authority links, low authority links, and links from a wide variety of sites to contribute to your winning website. So while your building relationships with college professors and government leaders, don’t forget to stay in touch with Uncle Tony and Aunt Martha. Search engines care about you being authentic just as much as your family does. What about links within industrial directories? Think about links from industrial directories the same way you’d think about attending a big trade show like IMTS. You want to be present, but paying for a booth might not be worth the investment. Most industrial directories offer a free listing that contains a link to your site. Many also offer a “premium listing” where you’ll have to pay to make your profile stand out from the rest. Use discretion with the premium listings, but make sure you’re present at a minimum in any relevant directory. Are all links good links? Links from seedy sites can damage your digital reputation and can have big SEO consequences. You can compare these links to investing time into a relationship you wouldn’t want your friends and family to know about. Like, what about that one friend you had that got kicked out of college for selling “Colorado Gummy Bears” out of his dorm room? There are websites that may get a lot of traffic for illegal substances and offensive services (and I know you know what I’m talking about), but those links don’t do you any good. You also want to avoid broken or unreliable links. Have you ever had a customer call your receptionist and get transferred to another department, but the wires get crossed and the call gets dropped? Or, what about if a prospect asks for a referral from a customer and the customer tells them about how great it was to work with that person who no longer works for you? Links need to send website visitors to the right place on your Manufacturing website. They can’t be dead ends. This post is about building links, not fixing them, but it’s worth mentioning that bad links and broken links can negate the impact of the good links you develop. So you know why links matter to manufacturers, but do you know how to earn good links? Leverage business partnerships in your link building strategy. Simply ask for them. If you get mentioned (or should have been mentioned) ask the publisher to include a link to your site. Most of the time they’d be happy to do so. There’s a lot more to link building than what’s covered in this post. Link building is a major component of SEO and there are entire businesses focused on building links (some ethical and others not so much). Researching the practice of link building can send you down a rabbit hole. We’d love to discuss it more!